Build your own set and Save 15%. NFPA Members save an additional 10%. Select, use, and maintain portable fire extinguishers that are appropriate to the hazard. 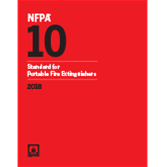 Apply the 2018 edition of NFPA 10, Standard for Portable Fire Extinguishers. Portable fire extinguishers are a critical first line of defense against small fires. For the best protection, be sure to select, use, and maintain extinguishers using the latest requirements as presented in the most up-to-date edition of NFPA 10, Standard for Portable Fire Extinguishers. A new requirement addresses maintenance of hose stations that are used in lieu of extinguishers. The fire classification marking system is expanded to include markings for extinguishers rated for Class AC and Class AK, while removing information on obsolete equipment. Guard against small fires with new NFPA 10, your all-in-one resource for portable fire extinguishers. Whether you're a servicer, facility manager or owner, or technician, you can depend on this important standard for current, comprehensive rules for the distribution, placement, maintenance, operation, and inspection of portable fire extinguishers -- as well as testing and recharging. Interested in other editions of NFPA 10? Use the drop down menu above to select the edition year you need. 2.4 References for Extracts in Mandatory Sections. 5.5 Selection for Specific Hazards. 5.6 Selection for Specific Locations. 6.2 Installations for Class A Hazards. 6.3 Installations for Class B Hazards. 6.4 Installations for Class C Hazards. 6.5 Installations for Class D Hazards. 6.6 Installations for Class K Hazards. 7.4 Carbon Dioxide Hose Assembly Conductivity Test. 7.6 Electronic Monitoring System Maintenance. 7.7 Maintenance of Wheeled Extinguisher Hoses and Regulators. 7.8 Extinguisher Recharging and Extinguishing Agents. 7.10 Prohibition on Uses of Extinguishers and Conversion of Fire Extinguisher Types. 7.11 Maintenance and Recharge Service Collar. 8.7 Recording of Hydrostatic Tests. Ever wonder what the difference is between an NFPA® handbook and a code or standard? We’re glad you asked. NFPA codes and standards both provide requirements for achieving outcomes. Handbooks take a deeper dive, providing the full text of a code or standard as well as expert commentary and features such as graphics, decision trees, testing procedures, case studies, sample forms and checklists, and other helpful aids to give a better understanding of the reasoning behind the requirements and how to apply them. The simplest way to think about it is that codes and standards list the technical requirements while handbooks explain those requirements to clarify how to apply them. Select, use, and maintain portable fire extinguishers that are appropriate to the hazard. Don't work without the latest edition of NFPA 10. Portable fire extinguishers are a critical first line of defense against small fires. For the best protection, be sure to select, use, and maintain extinguishers using the latest requirements as presented in the 2013 NFPA 10: Standard for Portable Fire Extinguishers. Stay up-to-date! NFPA 10 is your complete, all-in-one source for fire extinguisher guidance. Whether you're a servicer, facility manager or owner, or technician...you can depend on this important Standard for current, comprehensive rules for the distribution, placement, maintenance, operation, and inspection of equipment -- as well as testing and recharging. NFPA® eBooks and PDFs can be downloaded immediately after purchase for quick, easy access. For the best reading experience, NFPA recommends using the free NFPA eReader application, NFPA eLibrary. Upon purchase of an NFPA eBook or PDF, you will be prompted with instructions for downloading and accessing. What is a Redline PDF? NFPA®'s Redline PDF contains both the current NFPA document and a Redline version of the document which shows changes from the previous edition marked in color. With the Redline you can quickly spot changed sections and tell specifically what has been changed from the previous edition, saving time and confusion. Changed sections are marked with a vertical rule. Deleted material is shown in red strikethrough type. New material appears in blue underscored type. 411.2411.3 Definition. Low-Voltage Lighting Systems. (A) General. Lighting Ssystems Ooperating at 30 Volts- volts or Less. A lighting system consisting less shall consist of an isolating power supply, the low-voltage luminaires, and associated equipment that are all identified for the use. The output circuits of the power supply are shall be rated for not more than 25 amperes and operate at 30 volts (42.4 volts peak) or lessmaximum under all load conditions. (B) Class 2. Listed Class 2 lighting equipment shall be rated in conformance with Chapter 9, Table 11(A) or Table 11(B). 411.3(B).411.4(B). Class 2 power sources and lighting equipment connected to Class 2 power sources shall be llisted.